Summer is known for having a slower pace, but this season looks like it will be more productivity-seeking than anything. Eric and I sat down the other night and made a big list of all the stuff we want to complete (or at least get underway) before this fall. Maybe we’re a bit over-ambitious, but we figure now is the time to take advantage of our free arms, restful sleep (at least for him), and long summer evenings. More than anything, I think it makes us feel more in control of our big upcoming life change, even if the sense of control/organization is merely a myth. Whatever works, I say. Among the house renos that we’re tackling, another big project that we’ve been working on is starting a new business. It’s the project we’re most excited about, but it’s also the thing that has been the most challenging and gray-hair inducing over the past several months. Lots of research, roadblocks, legal documents, design, obsessing over details, etc. I enjoy this project immensely because it’s so near to my heart, but my lack of patience doesn’t suit me well for this type of slow-to-make-progress work. It always amazes me how long things take. I guess that’s why I love blogging so much. I can work on a post for a few days and then hit publish. Taking 3 years to write a cookbook was the ultimate challenge, but it helped me appreciate the valuable lessons and learning opportunities along the way. I think this new project is already doing that. Considering all the obstacles we’ve faced with this hopeful business I know it’s still a bit too early to divulge all the details, but when things start coming together a bit more I’ll be sure to share! On the recipe front, I’m still making a lot of quick and easy recipes! I’ve been on a big homemade nut milk kick over the past couple weeks. Tell me, is there anything better than guzzling a cold jar of homemade milk straight from the fridge? This is my first time making hazelnut milk, but let me tell you it’s the best milk (from any source!) that I have ever tasted. I was really not expecting to love hazelnut milk so much, but it just worked. I made two batches on the weekend and both disappeared within 24 hours. Hazelnuts are a splurge-worthy purchase for me so it’s more of an once in a while treat rather than an everyday affair, but I guess that makes it even more special. It’s the kind of homemade nut milk you whip out to dazzle house guests or simply to treat yourself, just because. It’s a drink that reminds you just how satisfying plant-based milks can be when you feel a bit burned out on the store-bought stuff. With a super creamy, nutty base and notes of caramel, cinnamon, and vanilla bean, this nut milk is fit for a high end coffee shop. Actually, it would be my dream come true if I walked into a coffee shop one day and they had this milk as an option! Just like I hoped, this hazelnut milk is the most amazing compliment to a morning cup of coffee or black tea. Coffee and hazelnuts are a match made in h-e-a-v-e-n. Yesssssssss! Skip the creamer and try this out instead. Or simply chug it back with abandon, pour some into a bowl of cereal, or blend it into a chocolate hazelnut smoothie or ice cream shake. I think I’ll do that next. Note: I used a ratio of 3/4 cup hazelnuts and 1/4 cup almonds, but feel free to use 1 cup of hazelnuts if you prefer. Decadent, luxurious, and totally splurge-worthy, this homemade hazelnut milk is fit for a high end coffee shop and it pairs perfectly in a cup of coffee or black tea. I use a mix of soaked hazelnuts and almonds, but feel free to use all hazelnuts if you prefer. It's lightly flavoured with notes of caramel (from Medjool dates), cinnamon, and a whole vanilla bean and I imagine you could turn it into a chocolate hazelnut milk quite easily by adding a bit of dutch-processed cocoa powder. This recipe is lightly adapted from my Homemade Almond Milk recipe. Place hazelnuts and almonds in a bowl and cover with water. It’s preferred to soak them overnight (for 8-12 hours) in the water, but you can get away with soaking for 1-2 hours in a pinch. Rinse and drain the soaked hazelnuts and almonds. Place nuts into a blender along with water, pitted dates, vanilla bean, cinnamon, and salt (if using). Rinse out blender and pour the milk back in. Now, pour it easily into a Mason jar and secure with lid. Chill in the fridge. It will stay fresh for 2-3 days. Give the jar a good shake before enjoying. Drink it alone, use it in cereal or smoothies, make hot oatmeal, and one of my favourites - use as a creamer in coffee or black tea. 3) You might be wondering – If I don’t have a nut milk bag can I use a fine mesh sieve? Yes you can. I don't find the milk gets as smooth compared to using a nut milk bag, but if you strain it several times, it comes out decent. Also, feel free to try a cheesecloth (you can even line the sieve with a layer of cheesecloth). I’m trying to get my boyfriend to start drinking more almond/non-dairy milk and I think this recipe may be the trick to swaying him. Looks divine! Hazelnut milk is delicious and all but now I’m DYING to know what your new business is! Starting a business with a baby on the way? You’re awesome! How did you use the leftover hazelnut/almond pulp? I always hesitate to make nut milk because then I have to think of a use for the pulp! I can only eat so many cookies and I find the texture of pulp isn’t great in things like muffins, etc. I’ve been adding a bit to my morning smoothies – nice fibre boost! Could you put leftovers in granola? Still new at homemade. I’ve never had hazelnut milk but this looks SO good, can’t wait to give it a try! While I agree- this is the stuff coffee shops are built upon…… I don’t think I know of any coffee shops that offer this as an option!! But it’s surely what I would order!!! 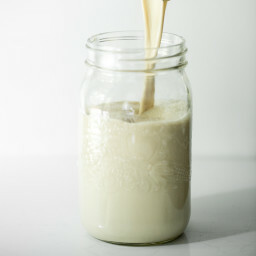 Homemade nut milk is the best! and when you blend it up with some dates, mmm, I could drink a gallon :) pinned! Gosh, just the name of this post makes me weak at the knees, another recipe to pin for ‘when I’ve saved up for my vitamix!’ Thanks for another great recipe! Stephanie, my dream is to own a vitamix too! I ended up going with the top-rated middle of the road blender recommended on different sites, and have had GREAT results with it. The Breville Hemisphere Control. It may take a couple of minutes longer than a Vitamix, but is a great alternative for those of us who don’t want to, or can’t afford to, plunk down a lot of money for a blender. It can totally handle soaked nuts as well as greens. You want a Vitamix (I have one, they’re awesome) – get one from QVC – they offer free (no interest) easy-pays plus they usually throw in some goodies, too! I got the Vitamix Creations Elite 48 oz (fits just perfectly under the kitchen cabinets) – came with the tamper, instructional DVD, cookbook, and stainless steel travel mug. Right now it’s $520 with 4 easy pays and free shipping and handling. They have other models too that are less expensive. Try to find one that’s “Today’s Special Value” and probably around Thanksgiving/Christmast they’ll still do free shipping and up to 6 easy pays. Love the easy pays, you get the product immediately and you don’t have to save up! Hi Angela – I am obsessed with making homemade nut milk as well! Although I sometimes hesitate to use it in smoothies because it is so special/precious … but then I end up wasting some of it as it goes bad pretty quickly! a) How long does your homemade nut milk last for? 3-4 days? b) How long do your nut bags last for? c) Do you know how many calories are in a cup if homemade nut milk? It’s confusing as so much of the pulp is discarded! Hi Hilary, It usually lasts for 2-3 days on average. The nut milk bag is reusable…I’ve had mine for over a year now and I looooove it. I don’t know how to go about calculating the calorie content. I can’t wait to make this! It’s going to be perfect with my morning cup of homemade chai! I bet this is super delicious!! This looks fabulous!! I need to get back into the habit of making my own nut milks and then I’ll add hazelnut to the mix. Wowweee! I think hazelnuts are the only nuts NOT in my freezer at the moment, but this seems like the perfect reason to buy some! Plus I’ve been dying to make some homemade nutella, as well. 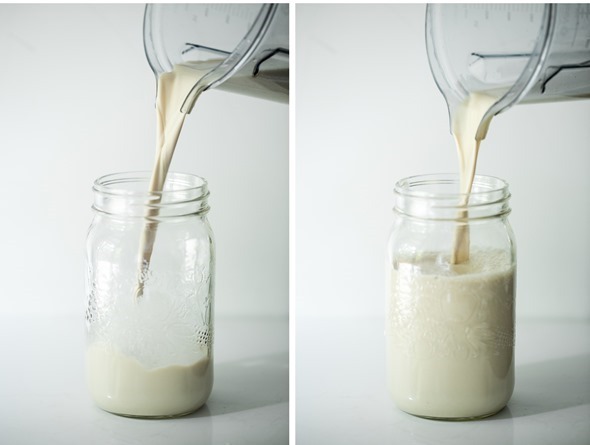 I love homemade almond milk and you’ve definitely convinced me to try hazelnut milk now. I love your ideas! Good luck with your new business! I hope it all works out and I can’t wait to hear about it! Also, this hazelnut milk looks and sounds divine! I haven’t ever made my own nut milk but it looks simple enough! I’ve been on a homemade iced Oprah chai tea latté kick this summer so this would be a nice change of pace! Wow! What a perfect thing for iced coffee season! Have you experimented with using the left-over pulp? I am guessing it could be used as almond pulp from homemade almond milk. I’m wondering if the finished milk can be frozen? I’m wondering what you would use 3 cups of hazelnut milk for in only 2-3 days??!! I’m just trying to think about how to make it last longer. It looks so YUMMY, I’d hate to waste ANY of it! omg, it’s so good I had a problem making it last LONGER than 1 day! But maybe that’s just me :) I’m not sure about freezing it…my guess is that it would separate, but might be ok with a good stir? I shall try this as I have hazelnuts in the fridge and use your almond milk recipe all the time. A couple of tips: I soak the dates in with the nuts and also bought a ‘jelly’ bag instead of a milk-nut bag. Cheaper, easier to find (Crappy, I mean Canadian Tire has them) and works exactly the same. MMMmmmm sounds so good! I was wondering, in the directions why do you say to pour it back in the blender after straining and then immediately from the blender to the jar for storage? Are you supposed to blend again in there? Is it just to make it easier to pour into the jar than trying to pour directly from the bowl to the jar? I love hazelnut milk and your version looks amazing! Is the 3 1/2 cups water you put into the blender the same water the nuts were soaked in? Or fresh water? Thanks! Nope, you rinse and drain the soaking water – so use fresh (filtered) water if possible. Hope this helps! Angela you CAN buy a nut milk latte! Apparently a snotty coffee shop refused to make an iced latte because they didn’t think it tasted good. So the owners put together a recipe they liked, which happened to be vegan. They used macadamia nuts and almonds and it looks so yummy. It was even featured in New York Times Magazine. Just keep that in mind next time you go to LA. Oh and I see a lot of people are asking about nut pulp, you mentioned in your book how you do a dehydrated granola with it. But I found that if you dehydrate the pulp right away, alone, you can pretty much use to anywhere you use almond meal. I find it works best in baked goods as part of the flour. You may want to add a tbsp extra fats to the recipe though. Your book was delivered to me here in Ireland this morning. It was the longest 3 day wait ever. I LOVE IT!!! I’ve been using the website for recipe ideas but nothing beats the feeling of a beautiful colourful book to flick through and revert to when cooking. Definitely going to try the hazelnut milk in a few weeks, once I get settled into my new house! Aw thanks for your excitement for the book! That’s all I could hope for. :) Enjoy! This looks so good! I love home made almond milk, but I just find it takes so much time! 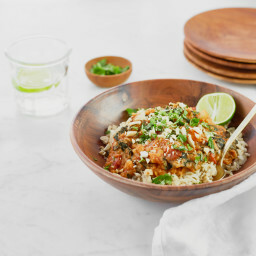 I’ll probably make this one on my day off next week :) I just want to say that I love your cookbook and that you have helped me develop a new taste for vegetarian and vegan foods! I feel so much better now in my own body! I love nut milks. I make two one liter jugs each week and it never makes it past a few days. One way that I drink it is to put in my thermos and I will put in Coffee Cubes that I make from the unused portion of the mornings coffee pot. This is a great refreshing drink that goes anytime through the day. Thanks for the idea on using Hazel nuts it is on my list for the next batch. I love this recipe! And I love coffee! Making almond/hazelnut butter is my go-to -that flavour combo is the bomb. Hazelnuts have a wonderful sweetness to them that I can’t get enough of. Totally coffee shop worthy. I’d love this milk steamed with a shot of espresso! Or in chai tea. Mmm. Oh I could totally do with a latte made with this right now! Great recipe Ange – I will keep this one marked as a future ‘must make’! So excited to hear about the new business you and Eric are creating. Both of you have awesome ideas and experience, so I’m sure it will be a big success! Just put the hazelnuts to soak-AND ordered your book! Thanks Stephanie – hope you enjoy! Love your recipes! 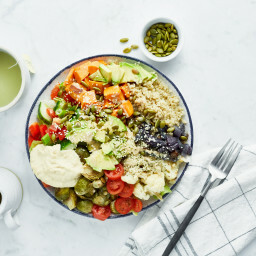 I’m new to the vegan lifestyle and your blog has been my go to source for finding yummy vegan meals. I can’t wait to try this one out. Have you ever tried freezing the homemade milks? I thought I might try so I can make two or three batches and keep for have the whole week. I’m still trying to find a good substitute for sugar for my morning coffee and this might be perfect! I haven’t tried freezing it yet (my guess is that it would seperate), but after thawing you could probably mix it all up again. Let me know if you try it out! Just a question on the leftover pulp: can you store it in the fridge straight away and then use it in smoothies, cereal, etc. within a few days or do you need to dehydrate first? you won’t need to dehydrate it first…I just pop it in the fridge and use it within 4 days or so. That’s awsome (I don’t have a dehydrator, so this is gr8!)! Haha! I thought those arms looked a little hairy ;) You make a great team and I am sure your new endeavor will be amazing…cant wait to hear more! I will try this nut milk for sure it looks amazing! This looks SO delicious Angela! Hazelnuts are one of my favourite nuts so ill be sure to try this one out. I was JUST thinking that I should make my own nut milk! I was shopping for some last night and none of them seemed quite right. Thank you, thank you for this amazing recipe! Yum! It would be my dream as well to walk in to a coffee shop and have options like this. I don’t know why Starbucks hasn’t caught on to the whole food intolerance thing. Nothing gluten free in the pastry case, and only soy milk. I can’t have dairy milk or soy :) I have hazelnuts in the freezer– so will have to give this a try! Do you ever have a problem with homemade nut milks turning sour? The first time I made it, I used chia seeds to thicken it, and it went sour in a day. The second time I made it (no chia), it was perfect. The third time- no chia, still sour in a day. I can’t figure out what I must be doing different those times it doesn’t work out. Gosh, this looks AMAZING… but can’t have nuts per Dr. Esselstyn, but he DOES allow chestnuts… the one very low fat nut… think you could come up with a chestnut milk??? It’s official. I need a nut milk bag. And a nut budget, for that matter. Love Jennifer’s idea for using the pulp in baked goods, but I wonder also if you could use this particular pulp to make homemade Nutella? You might need to add a little bit of extra fat, but it could be awesome. I just made this recipe this morning; it is divine. Next time I’m doubling the batch! My daughter will love it with her chai that I’m about to surprise her with. Thank you for yet another delicious variation for nut milks! Yum, yum, YUM! I’ve been making your homemade almond milk on a pretty regular basis, and I actually have some hazelnuts kicking around in my pantry right now. YAY this is happening soon! honey). Just thought I’d let you know (read: it would mean the world to me if you took a look). Here’s the link to the video if you’re interested! I always make my nutmilk with almonds, will have to try hazelnuts as well! Oh. My. Word. This looks aaaahhmazing! Do you think I could try making a smaller batch in my nutribullet? We, sadly, do not own a Vitamix/Blendtec yet. 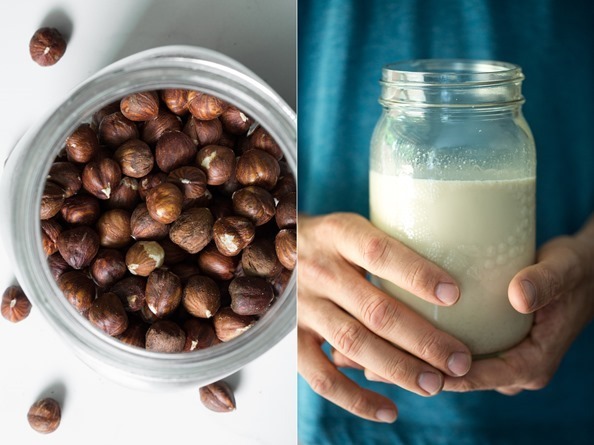 Hazelnut milk is my absolute favourite – for some reason I haven’t tried making it at home yet! I imagine it would make a heavenly chocolate frappuccino. No food additives, any extra sugar or sweeteners. 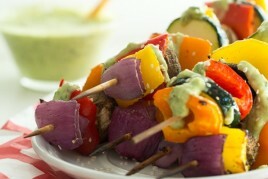 Healthy and delicious, perfect! Love this post. This looks so delicious. I would definitely love to try this in coffee. Am getting rather sick of soy and also find almond milk too thin. Thanks for sharing; the hazelnut milk sounds incredible. Hazelnut milk sounds amazing! I have seen it in the grocery stores here but have never ventured out and bought some! It looks like now I NEED to make some – looks like the perfect based for vegan chocolate milk (Vegan Chocolate Nutella Milk? OMG). :D Thanks for the great recipe! WOW! I’ve noticed that our whole foods has all different kinds of nut milk at the coffee bar, but with recipes like this they better step up their game asap! I can’t wait to try an iced coffee with this milk in it. Running to the store for hazeluts asap! Love this recipe! Its so creative and awesome! Can’t wait to try! Love your blog!! I have just received my Vitamix and this one is on the list for sure. Opening that box was like Christmas, I was all giddy and everything. Had a Green Monster this morning. I totally see what the hype is about with these little gems. Made my tummy smile!! Thanks again as always Angela. There is not one single recipe of yours that I have not loved. 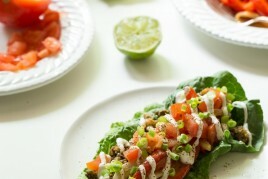 You have definitely made the change to a vegan diet all the more enjoyable for me. I made this, and came back to check your recipe because I must say I found it kind of bitter. I came back to check and see if you had blanched hazelnuts but I see you still have the skins on. I don’t think this is a problem with your recipe, but I’d love some help trouble shooting. What did I do wrong? Are they too old maybe? I soaked them for 12 hours. Hey Ali, Yup, I left on the skins and I haven’t noticed it being bitter at all. It sounds like you just need a bit more sweetener/dates for your taste? I’ve recently started making your nut milk and found that it’s not as hard or time consuming as it seems. Thanks so much for the recipe. What I’m trying to perfect/replace is the Dream Blends combo of hazelnut, almond, and cashew unsweetened (so I can use it in everything). Minus all the bad ingredients and additives, it’s the best stuff I’ve tasted. I’ve recently tried equal amounts of all three and two dates, but it’s not quite there. I’m going to try your hazelnut version next but would love for you to try putting some cashews in there and perfect the ratio for your next milk option. Angela, this milk looks soooo good!!! Your project sounds super exciting!!! I can’t wait to hear more!! I just made this today with two dates (SPLURGE!) – and it is absolutely delicious! I’m definitely not a fan of hazelnut flavouring, but I love the real thing. I strained it through a jelly bag I found at Canadian Tire, and then poured it through a sieve lined with cheesecloth. That makes a real difference in getting it super smooth. My Osterizer is good, but probably not as good as a Vitamix! Thanks for this! This sounds so good. Do you think it can be strained with a French press? I don’t have a nut milk bag and I’m not sure my sieve is fine enough. I have long enjoyed a store bought product made with hazelnuts and soy – that I used as a flavouring in my morning coffee. Your recipe makes it easy peasy so I’ll be making a batch to try. Thank you! Question: I made almond milk from your recipe for the first time last week and I LOVE it. I made a batch to send with my husband as a gift to his parents (a two-hour drive) and by the time he transported the bottle of milk and they drank it the next morning, it had spoiled. Any ideas why it could have gone bad that quickly? Is heat a factor (the milk was unrefrigerated in transit). Thanks for your help! Hi Leslie, Oh that’s a bummer! Yes, my guess is that it was not being refrigerated on the trip..I would keep it in a cooler with ice next time. Hope the next batch can be enjoyed! i use a piece of muslin in a colander to filter my nut milk. it does a great job and i can “twist” the top closed to squeeze the milk out of the pulp; it’s easy to clean the dry pulp out of to pour more milk in to drain. i found with cheesecloth i was getting little threads in it and it didn’t filter it as finely. I was really laughing because of the last foto that shows how to squeeze the milk out of the milk bag. Hopefully those arms aren’t yours :p, I know it’s a bit lame, but I found it very funny. I am going to try this! Looks delicious. Your recipes are fantastic! I just use a square piece of muslin in a strainer. You can buy a yard of it for less than the price of those nut bags :) Just be sure to wash it before using to get all of the starch out of the fabric. These photos made my jaw drop! Who knew making nut milk could be so beautiful!? Great job with your project list. 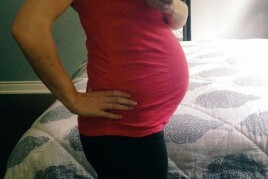 I find that with each pregnancy there are a few things I feel are “must dos” and I always feel good getting them done – or at least started. While you have energy these next 4-6 weeks, go for it! it’s meant to say ‘when i make’, this auto correct on the computer is causing me problems!! Thank you so much for this divine recipe! I’ve been working to eliminate dairy and processed sugar from my diet for a long time now, and creamy coffee has been one of the toughest to kick. None of the store-bought vegan creamers I’ve tried come even close to the real thing, but yours does! I’ve also been adding the nut pulp back into green smoothies throughout the week – YUM. Oh I havent heard of this recipe before. Gotta do it sometime for my family. Thanks Angela! this looks delicious, definitely will be trying this recipe out. thanks for the inspiration! Mmmm pinning this, sounds amazing! Thanks! This sounded so delicious that I finally made nut milk for the first time. Thank you! I wish I had used only 1/4 of a vanilla bean, though. YUM!!! I made this recipe this morning — made yummy raw oats + berries breakfast. I am definitely going to freeze a bunch in cubes; envisioning mixing it with coffee for better-than-frappucino goodness in my blender this weekend! I need to get some hazelnuts…or, A LOT of nuts right now. We are low on everything (that will be one hefty grocery bill – eek!). This does sound like a dream. I can taste it already!! I tried it and can say with fair amount of confidence this is the best nut milk period. I had no dates on hand so substituted raw honey. Particularly good with cold brew coffee and chai. Just tried the fresh hazelnut milk latte at Superba here in LA. Delicious! Love your blog. I made this last night and it is fantastic! It’s lightly sweet and very vanilla-flavored. Tastes much better and less artificial than store-bought milks. I have (chugged it by the cup) used it in overnight oats and tea so far; both are delicious. Hi Angela~ I have a jelly bag I use for making – well – jelly. Your nut bag looks to be the same fabric and texture. Do you think I can use my jelly bag instead? Wow! This looks absolutely fantastic! I am very much looking forward to trying this out. My boyfriend loves hazelnut milk. I think I would like to try it with a little bit of the cocoa powder. Thanks so much for the recipe! You are the best! My parents have a HUGE hazelnut tree in their backyard and never know what to do with them all. I’m so excited to make this! I was grumpy because I didn’t have any greens for my morning smoothie, then remembered I had this in my fridge. Blended some with a frozen banana and some quinoa flakes, and holy cow, it was the best thing ever. Thanks! OMG… better than Starbucks any day, Angela! And I just love your photography! *note to self… finally get a Vitamix, lol. I made this with just hazelnuts and it was amazing! Thanks for the delicious recipe!! This looks delicious! I think this would be yummy as coffee creamer. Can you tell me what kind of nut bag you have and where you got it from? Thanks! Hey Stephany, I bought it from Amazon here: http://www.amazon.com/gp/product/B00DAI7KTI/ref=as_li_tf_tl?ie=UTF8&camp=1789&creative=9325&creativeASIN=B00DAI7KTI&linkCode=as2&tag=ohshgl02-20 Hope this helps! Hi there- if I’m using maple syrup, approx how much should I use? Thanks! Can’t wait to make! YUM! Easy and delicious. I have made this twice now. I don’t have a Vitamix, so I scrape my vanilla bean instead of chopping it since I’m not sure how my blender would do with the sticky pod. Otherwise, I followed the recipe exactly and it is truly worthy of a high-end coffee shop. Today for the first time I made nut milk following this recipe and it’s crazy good! any idea what the calcium percentage is for hazelnut milk compared to cow’s milk? Eeek help I bought roasted hazelnuts! By mistake :( can I use them in this milk?? Thanks for any advice! Oh my, my! This is perfect in the OhSheGlows hot cocoa recipe and topped with homemade marshmallows (I use gelatin and marshmallow root but there are vegan options, too) and coconut caramel sauce! Holy hannah. Just made it in my Nutribullet. Very yummy indeed. I just added a few prunes, and a splash of vanilla. Can’t wait to put it in my morning coffee. I’ve never been able to figure this out…if I soak my nuts and then dehydrate them, do I need to soak them again before using in recipes? Is the water content of the nuts important? The title of the recipe mentions caramel, but I don’t see any reference to caramel in the recipe. Is it the dates that give it a caramel flavor? Just made this yesterday for the first time. Absolutely perfect, wouldn’t change a thing. Would this be OK to not drain it through the cheese cloth? This is awesome creamer! We tried it as is and then did a second batch after blanching the hazelnuts. The skin was just a bit too bitter for us. The taste is amazing! Thanks for the recipe! This milk is amazing. It truly is coffee-shop worthy & better than any non-dairy cream you can buy. Can’t wait to make a second batch! I’ve made this recipe at least a half dozen times now and I love it. It’s perfect as is but tweaking is always fun. I wanted to replicate the chai flavour that I had in India, not the North American coffee shop version as I find that unbalanced – way too cinnamony. I love the result of my experiment, it’s delicious in my morning tea, or and chilled on its own. Nuts, dates, and pinch salt as recipe, but add seeds of 3 green cardamom pods, 1/4 tsp each cinnamon and ground ginger, 3 or 4 whole black peppercorns, and about 1/8 tsp ground clove. No vanilla. Blend and strain through bag. So fragrant and tasty. Using your hazelnut recipe, I have just made a great smoothie. Almond butter, chia seeds, an extra date and 2 ice cubes with a teaspoon of cacao and a tablespoon of hemp protein powder. Yum! This is so delicious! I’ve tried many recipes but this is by far the best! I’m going to share with my family as gifts (with all the ingredients in a mason jar, along with a nut bag) and I know they are going to be just as excited as I am. Yum…yum…yum!!! Hazelnut milk… Yum! I can’t wait to try this. This is delicious and so easy to make. Love it in my iced coffee and drinking it straight! This is a great nut “mylk”! And not only on it’s own … drank it with a shot of espresso yesterday and as I’m writing this I’m enjoying a little porridge cooked with this milk. Grated a bit of apple into it and sprinkled some coconut sugar over the top … I’m in heaven. I am allergic to banana and therefore would like to know if there is any alternative ingredient. Apparently almost every recipe has bananas. If i just ignore the banana will the outcome be as good as without it? Hi Bruna, do you have any specific recipes in mind? I’d be happy to offer some suggestions for substitutions where possible! I made this recipe (from Oh She Glows Every Day), and made lattés with it. It’s like drinking Nutella! With coconut whipped cream on top! Indulgence Friday. I used the pulp to make waffles. It was amazing! Thanks!